In this episode, Ron Vanderkley speaks with Professor Geoffrey Spink from Wollogong University about his team’s work on artificial muscles. The process is simply to attach one end of a piece of fishing line to an electric drill and the other end to a weight so that it provides a bit of tension. As the drill is switched on and starts rotating, the weight end of the fishing line is impaired from twisting, and eventually this leads to a phase called over-twisting, where the fishing line forms a coil. Finally, a blast of heat sets the shape and it is left to cool. To make the coil work as an artificial muscle, a little bit of tension is applied again, and then some more heat. The polymer fibers can be made very thin or very thick, with the amount of force generated increasing as the fibers get thicker. The lifespan of the polymer cord muscles has been tested for one million cycles, and there was no degradation in performance. Possible uses include artificial muscles for prosthetics, and the design of light weight humanoid robots. In development is a new lymphoedema compression sleeve, which will use these muscle fibres to gently massage the arm. The garment may prevent the build-up of lymphatic fluid and the discomfort that it causes. 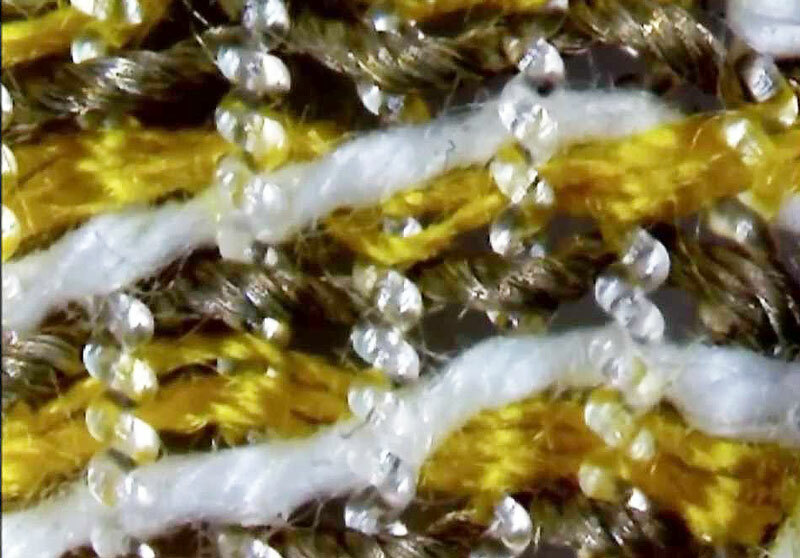 Woven into clothing fabric, this could create smart garments that are powered by body heat. If the wearer gets too hot, the muscles expand, the weave opens up and that releases some heat until the body has cooled down again. Similar concepts could be used to regulate the temperature in a building or greenhouse. Professor Geoff Spinks is an Australian Research Council Professorial Fellow. His research interests focus on new materials and nanotechnology and he specialises in the development and application of materials for artificial muscles. Spinks has published over 160 journal articles, including 4 co-authored articles in Science magazine. He is the co-recipient of in excess of $35m in grant funding. Spinks has worked closely with industry including a sabbatical leave with BHP Research and Allied Signal Inc. (USA) and collaborative projects funded through the ARC Linkage and CRC schemes. His current interests include new product development (such as the “Lymph Sleeve”) and new manufacturing methods (such as 3D printing) that use his artificial muscle materials. Spinks has had a strong engagement with teaching across all levels of engineering materials and was co-founder of UoW’s bachelor degrees in Nanotechnology. He has supervised 22 PhD, 7 Masters and over 50 final year / honours students to completion.